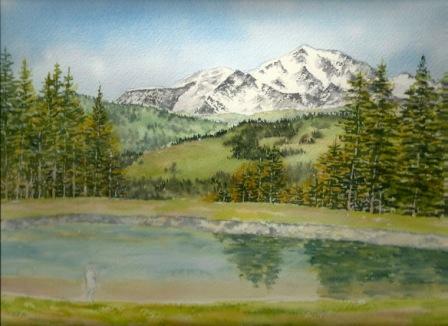 Why not come and enjoy your hobby or learn to paint in one of the most beautiful alpine locations that can be found. The scenery is awe-inspiring and there are subjects to suite all levels and tastes. Our chalet has been renovated to the highest standard and that added to mouth watering food & wine in a homely and welcoming atmosphere make for a complete package. At True Alpine we pride ourselves on quality and exceptionally high standards without compromise. We have had many years of experience working in an Alpine environment. On a typical day we start with a relaxed healthy breakfast at around 8 am. We normally head off from the chalet at around 9.30 either walking to one of the locations close by or you are chauffeured to the location. All of the locations that have been chosen are beautiful and interesting. There is always ample tea and coffee available on location. A picnic is provided everyday so there is no need to leave the venue for lunch other then taking a walk to take in the breathtaking scenery. The day’s painting normally concludes at around 4.30 and then the group return to the chalet for afternoon tea. If everyone is still in full flow with their work at 4.30 and would like to stay and complete their subject then we will carry on until everyone agrees to stop to ensure that everyone gets the best out of their painting holiday. We have an indoor location available if the weather choses not to be kind to us. (All courses do require a minimum of 5 We do require a minimum of 5 students to run each course. £945 pp - Full holiday cost for a painter in a private room with en-suite facilities. £745 pp - Full holiday cost for painters sharing a room with en-suite facilities. £545 pp - Full holiday cost for a non-painting partner/friend sharing. A welcome drink on the day of your arrival (an opportunity to discuss the itinerary for the week and answer any questions you may have). 7 nights accommodation in twin/double room. Packed lunch for 7 days. Evening meal with bottled wine for 6 nights. The chalet staff have one day off a week so on their night off you have a great opportunity to sample the local cuisine. 5 tuition sessions with Professional artist Yvette Wiltshire. A minimum of 5 hours tuition a day will be available. There will only ever be a with a maximum of 8 students. Tea and coffee are available in the chalet at all times. Free Internet WiFi in the chalet. Dinner on chalet staff's day off. Thank you Yvette for organising the trip for me and providing an excellent painting holiday. I enjoyed the whole week and the Luxury stay at ‘True Alpine’. Thank you so much. Many thanks for the time and effort that you put in to make my time with you such a memorable occasion. Thanks once again for your help over the week. It could not have been a better location, and the accommodation and standard of cooking was superb, as was the hospitality shown by Mark and Michelle. All in all a great week. If all the others enjoyed it as much as I did, you must have had a very happy bunch of guests. Thank you for a great week! We had lots of laughs and had a fantastic ‘fun’ time! Thank you to Yvette for her patience and guidance, Michelle for her fantastic food and home making skills, Mark for his humour and fun, as well as being our chauffeur! and to both Mark and Michelle for their very generous hospitality and warmth. Another great week with superb food and hospitality. An absorbing week again with amazing food, camerarderie and hospitality. A lovely week – so many thanks for lovely hospitality and delicious food. Ann and David. June 2011. Biography. YVETTE WILTSHIRE Artist and Tutor. A mainly self taught artist working in various mediums such as ‘Watercolours’, ‘Pen & Wash’, ‘Pastels’, ‘Acrylics’ and Oils that started off as a hobby when joining adult education classes with my father when he retired, then later as a teacher. I have a thoroughly enjoyable job teaching and assisting others to pursue a hobby / interest in art for both pleasure & relaxation or if required by the ‘learner’ to gain a qualification. I love the challenge of a complete beginner that tells me that they cannot draw and paint, and the pleasure that they get when they frame their first painting and the joy that brings to them. I have worked hard to produce paintings worthy of selling, which initially was not easy, so I know just how nervous we all start out in our painting journey, the excitement you feel when you sell your first picture also your first commissioned painting for someone’s special present, that for me is still the same today. Between 2003 and 2004 I completed my Teaching qualifications for 'Further Education', and started teaching in 2003 for local adult education centres in the Cornwall area as well as several private classes, I am currently working for Cornwall Council, in Liskeard at the Caradon Adult Education Centre, West Country Creative (For Further details see 'Jo Hunter' on SAA website) as well as teaching 3 private classes in Lostwithiel and Menheniot, plus one to one tuition sessions. I have no one main subject that I work from but enjoy dabbling in all subject matters, allowing me to assist learners in their preferred subject area, but I particularly enjoy Pen & Wash and Water-Soluble pencils for Buildings or parts of, such as Doorways and Foliage, I like pure watercolour for most subjects, and pastels for Animal Portraits, Landscapes, Seascapes, Trees and Foliage, Acrylics in all subjects, and finally I dabble in Oils purely as a hobby at this time. I am so fortunate to have been able to turn a hobby into a career and still enjoy it as if it was still a hobby; meeting and helping so many people enjoy and develop their skills and interest in painting which is very rewarding. Animals, Buildings, Colour Mixing, Flowers And Gardens, Landscape, Pet Portrait, Portrait, Seascapes and Water, Skies, Still Life, Townscapes, Trees and Foliage, Waterways and Canals, Wild Flowers, Wildlife.